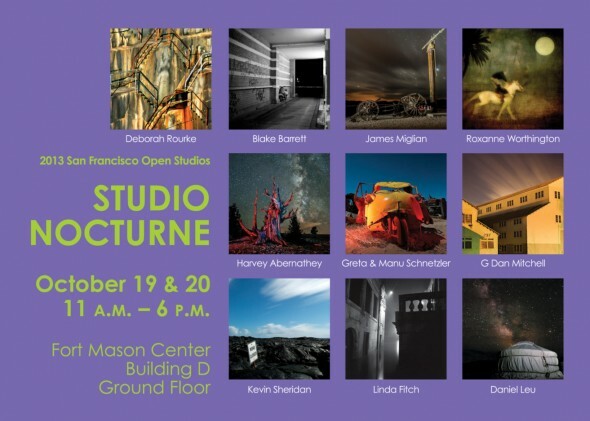 Studio Nocturne returns to the Fleet Room in Building D at Fort Mason for its 11th year as part of Art Span SF’s Open Studio 2013 on October 19 and 20 from 11am to 6pm on both days. This group of 10 photographers all share a passion for night photography and are part of the vibrant San Francisco night photography community. Studio Nocturne was led for its first ten years by Tim Baskerville of The Nocturnes and many members of the group found their way to night photography through Tim’s classes and workshops. After ten years of leading the group, Tim stepped down after last year’s show to concentrate on his personal work and teaching. However, the group continues to be inspired by Tim’s enthusiasm and the sense of community he created around night photography. Tim’s leadership created a strong foundation for this Open Studio to continue to flourish and inspire others. Returning members, Manu and Greta Schnetzler and Roxanne Worthington, who have been with the group from its inception are leading Studio Nocturne this year. Several other members are returning after multiple years of participation and, as always, the group welcomes some new members each year. This year’s lineup features many unique expressions of the idea of the “nocturne” in photography.